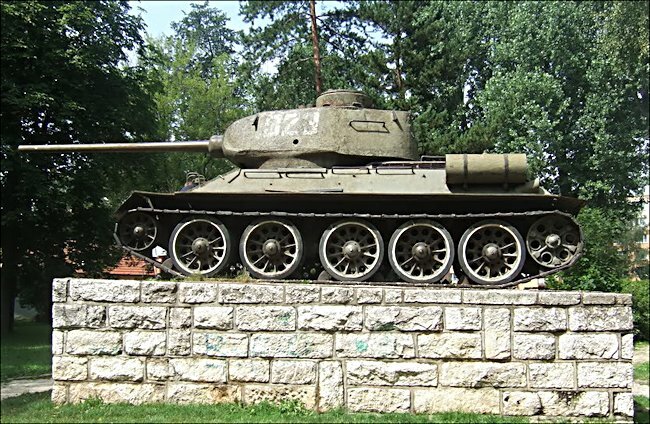 This T-34/85 Russian Soviet WW2 Medium Tank can be found as a monument in Kezmarok, Slovakia. This T-34/85 of the 1st Czechoslovak independent tank brigade is standing next to the castle of Kezmarok, in the middle of a small park. It commemorates the liberation of Kezmarok in 1944. Why was the T-34/85 medium tank needed? The Germans believed that their invasion of Russia in 1941 would be a short military action like all the previous operations they had successfully won in Austria, Denmark, Poland, Norway, Belgium, Holland and France. German High Command did not think the Russians capable of producing a battle worthy tank. When operation Barbarossa, the invasion of Russia, started they had no intention of replacing their panzer III and IV tanks. They were delayed in reaching their goals partly because of the unexpected high quality of the Russian T-34/76 and KV-1 tanks. Most of their infantry anti-tank guns and the cannons fitted to their Panzer 38(t), Mark III and Mark IV tanks just bounced off the front armour of these new Russian tanks. Although the German designers, at the time would never admit that they copied many of the design features of the T-34 tank that is exactly what they did to produce the panzer mark V Panther tank and later the King Tiger tank. These wide track, large high velocity gun and slopping armour technologies were also incorporated in some of the later tank destroyers like the Jagdpanther, Jagdpanzer IV and the Hetzer. The Germans could make tanks that would match the Russian tanks in quality but never in quantity. That was a war winning failure. After defeating the Germans at Stalingrad during the harsh winter of 1942-43 a huge bulge develops in the battle front around the city of Kursk, which is south of Moscow. It is 80km wide and 100km deep. The Germans intended to execute pincer movement from the north and south to trap and then destroy the soviet forces in the bulge. The Russians learn of their plans and flood more tanks and troops into the area and make it a fortress. 1,336,000 Russian soldiers and 3444 tanks were waiting for the attack. They had used their time well. They had created lots of prepared defences and killing ground traps for the Germans. The Germans were confident that their new panther tanks and Tiger I tanks would cancel out the Russian advantage in numbers. The Kursk offensive started on 5thJuly 1943 and meet stiff resistance. The depth of Soviet defences meant that the Germans failed to make the advances they expected. At Kursk the Russian army discovered that their T-34/76 and KV-1 tanks no longer had the edge they used to have that allowed them to win tank on tank combat. The Russians still win the battle because of the amount of men and tanks they have to command, they over whelm the battlefield. As the basic design of the Soviet T-34/76 tank out classed all the German tanks by such a large margin in 1941 and 1942. The Russian engineers did not have to spend time creating a new tank. Just a way of fitting a larger gun to it. At Kursk they found that the 76.2mm gun had difficulty penetrating the frontal armour of the enemy’s new Panther and Tiger tank at anything other than dangerously close range. In August 1943 work began at upgrading the T-34 to make it a viable effective combat vehicle. After the changes were made the new tank entered production in January 1944. It had much bigger turret that could house the bigger 85 mm gun. It could penetrate the frontal armour of the German Panther and Tiger tank. It took its name from the gun and was called simply the T-34/85. It had a five man crew like the earlier tank, thicker sloping armour. It could hit a top road speed of 50km/h. When it arrives on the battlefield it is the most powerful Allied tank that the Germans have to face. Because it used most of the T-34/76 chassis components it could be built on existing factory production lines unlike the German new tanks. It there for could be made quicker and in far greater numbers. 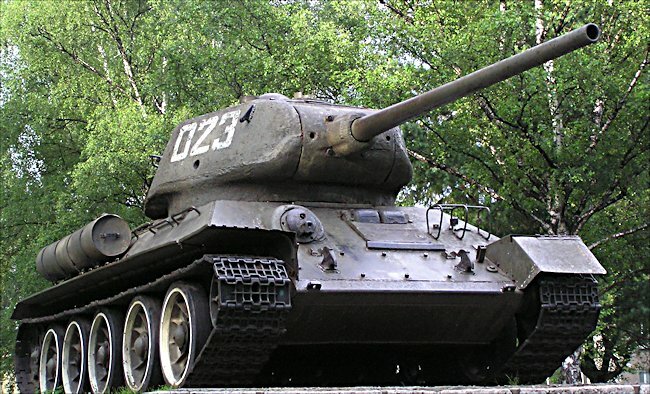 In 1944 11,000 T-34/85 medium tanks were built. This was two and a half time the amount of Panther tanks that were produced. It entered operational service with the 1st Guards Tank Army and was welcomed by the crews as a tank that compete successfully against whatever the Germans put against them. When offensive operations against the Germans restarted in the Spring of 1944, the improved training, skill and operational experience of the Russian tank crews was enhanced by access to a new powerful tank. They were able to inflict hard hitting blows against their enemy.